News stories on fundraising in Connecticut’s Fifth Congressional district have typically focused on a series of allegedly bogus $2,500 checks provided to Democrat Chris Donovan’s campaign coffers. But those questionable contributions are a relative drop in a very large bucket of cash that has been spread among the seven candidates still in the race. Through April, more than $6.5 million had been given by individuals and political committees (or loaned by the candidates themselves). Democrat Elizabeth Esty had collected the most in individual contributions, with $1.2 million, and Donovan was the clear leader in PAC money, with nearly a quarter-million dollars donated — twice the amount collected by the other six candidates combined. 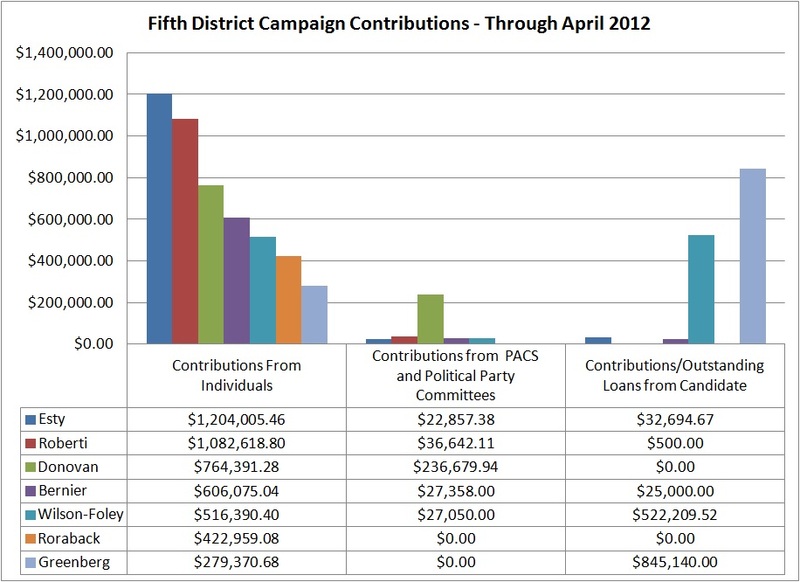 This chart gives a summary of donations and loans made as of the latest filing with the Federal Election Commission. Click any of the photographs below the chart for a searchable and sortable database of donations to that candidate, including all PAC contributions and all individual contributions from people who have given at least $200. Donovan is highly suspect. Look at the disparity between his donations from PACs and individuals when compared to the other candidates. Donovan has a long histroy of supporting working families and the unions have responded with PAC contributions. He actually has the highest number of contributors from Connecticut, most of the contributions are small amounts. Hi there, simply become aware of your weblog thru Google, and found that it’s truly informative. I’m gonna watch out for brussels. I will be grateful for those who continue this in future. A lot of other people will probably be benefited out of your writing. Cheers! Thank you for another magnificent post. The place else could anybody get that type of information in such an ideal method of writing? well-preferred than you might be now. You are so intelligent. sites on the web. I will recommend this blog!